Is an All-Female Spider-Man Team-Up Movie Being Planned? While Marvel Studios and Warner Bros/DC Comics have unveiled their long-term plans for superhero franchises over the past few weeks, Sony Pictures is still trying to determine how to move forward with their Spider-Man property, in the wake of disappointing results for The Amazing Spider-Man 2. Their sequel The Amazing Spider-Man 3 has been put on the back-burner, while the studio focuses their efforts on the spin-off The Sinister Six. A new report from Badass Digest claims that Sony is developing a project they're currently calling Glass Ceiling, which will bring all of the female Spider-Man characters together. If the project does move forward, Glass Ceiling is not expected to be the official title, but that's what Sony executives are calling it for the moment. We reported in August that Sony is planning a female-lead Spider-Man movie, with the studio hiring Lisa Joy Nolan to write the script, but it wasn't clear which female Spider-Man character the project will focus on. This new report reveals that a number of different characters will all team up together for this new ensemble. 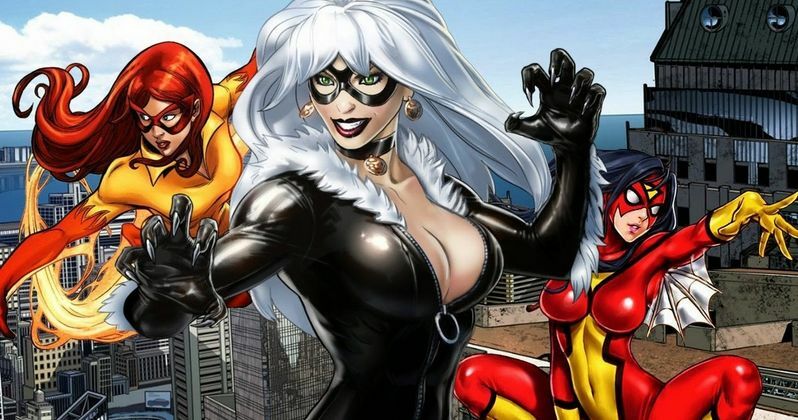 While the site isn't certain which female characters will be included, The Black Cat, Silver Sable, Spider-Girl, Silk, Spider Woman and Firestar are mentioned as possibilities, but nothing has been confirmed. It's all speculation. Naturally, no story details were given, and it isn't known if Andrew Garfield's Spider-Man will make an appearance as well. The Black Cat was briefly introduced in The Amazing Spider-Man 2, played by Felicity Jones, although it isn't known if she will return. In the comics, Black Cat was a at cat burglar who possesses the unique ability to give other people bad luck, and Silver Sable is a deadly mercenary. Silk is a fairly new character, who was bitten by the same radioactive spider that gave Peter Parker his powers, while Spider-Girl comes from an alternate universe. Firestar was actually created for the 1980s animated series Spider-Man and His Amazing Friends. The site also reports that the upcoming Spiderverse, an upcoming comic book series which brings every version of Spider-Man together, may include female variants of characters that Sony would have the rights to. It isn't known how far along in the development phase this project is, but would you like to see all of the female Spider-Man characters together in one movie? Chime in with your thoughts below.